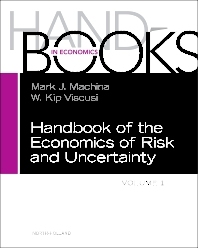 The need to understand the theories and applications of economic and finance risk has been clear to everyone since the financial crisis, and this collection of original essays proffers broad, high-level explanations of risk and uncertainty. The economics of risk and uncertainty is unlike most branches of economics in spanning from the individual decision-maker to the market (and indeed, social decisions), and ranging from purely theoretical analysis through individual experimentation, empirical analysis, and applied and policy decisions. It also has close and sometimes conflicting relationships with theoretical and applied statistics, and psychology. The aim of this volume is to provide an overview of diverse aspects of this field, ranging from classical and foundational work through current developments. Graduate students and professors worldwide working in all subdisciplines of economics and finance. Mark Machina is a Fellow at the Amercian Academy of Arts and Sciences and has taught at Columbia University, the University of Cambridge, Princeton University, the People's University of China in Beijing, Duke University, and the University of Wyoming. W. Kip Viscusi is the award-winning author of more than 20 books and 300 articles, most of which deal with different aspects of health and safety risks. His pathbreaking research had addressed a wide range of individual and societal responses to risk and uncertainty, including risky behaviors, governmental regulation, and tort liability.